Today on Greetings from Texas, I'm proud and honored to interview 3rd grade teacher, Jill Jacobsen, who currently has a transgender student in her classroom. Jill was my sorority sister at Augustana College and remains a great friend to this day. Normally in a situation like this I'd go on to tell you about all the trouble Jill and I have got in over the years with photo evidence to supplement but because Mrs. Jacobsen, as her students call her, is now the inspirational, well respected educator that she is today I will refrain from doing so, tell you that we hung out in the library on Saturday evenings, and pass the figurative mic to her. You’ve had hundreds of students at this point in your teaching career. How is having a transgender student different - or is it different? What needs do they have that your other students don’t? All students have the same need to feel accepted and cared about. All students want to be liked by their teacher and peers, especially transgender students. Every educator that I talk to is starting to see transgender students come through the school system now. It is becoming increasingly common, probably more common than people would think. 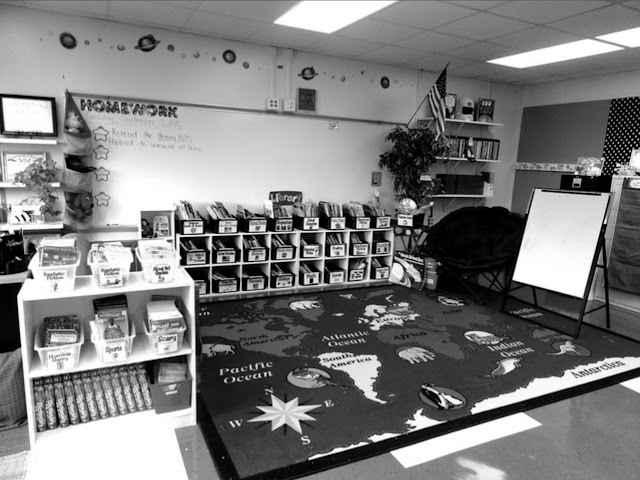 Since this is the first year that I have had a transgender student, I received some training before the school year started to be sure that I was ready to answer parent and student questions and to provide me with resources to create a safe learning environment and ensure that all students see themselves reflected in my lessons. It is important for teachers to have a gender inclusive curriculum whether or not there is a transgender student in their class. I embed diverse literacy in my lessons, and I teach my students that it is important to be unique. I talk about how lucky we are to live in an ever-changing world where everyone is different. We not only accept each other’s differences, but we embrace and celebrate them. I am so proud of all of my students. It gives me hope for the future to work with them each day. How do your students respond to their transgender peers? Are they open and accepting? Do they fully understand? Are there mean kids? What about the teaching staff and administration? My heart swells with pride and hope when I think about how accepting the other students have been and how overwhelmingly positive the reaction of the entire school community has been. Since I teach in a small community, the transition of a transgender student is quite apparent. As I said, I have been trained on how to answer student and parent questions. I was prepared to explain to third graders that some people may be born one gender, but their brain is that of the opposite gender and we must respect that and call the student by the pronouns and name they feel most comfortable with. I was prepared to tell concerned parents that it is every person’s right to use the restroom of the gender that they identify with, and if their child is uncomfortable with that, their child is welcome to use another restroom in the building. However, I haven’t had a single question about it. Not a single comment has been brought to my attention. Kids are surprisingly accepting of others. It doesn’t matter to them. I’m not saying that the road ahead for these students will always be easy. They will most likely have to deal with some type of bullying, but so far, the most discussion I have heard on the topic was an innocent question such as, “Are you a boy or a girl?” The answer was clear and unwavering, so the discussion stopped there. When a child can be confident about who they are, others are more accepting. 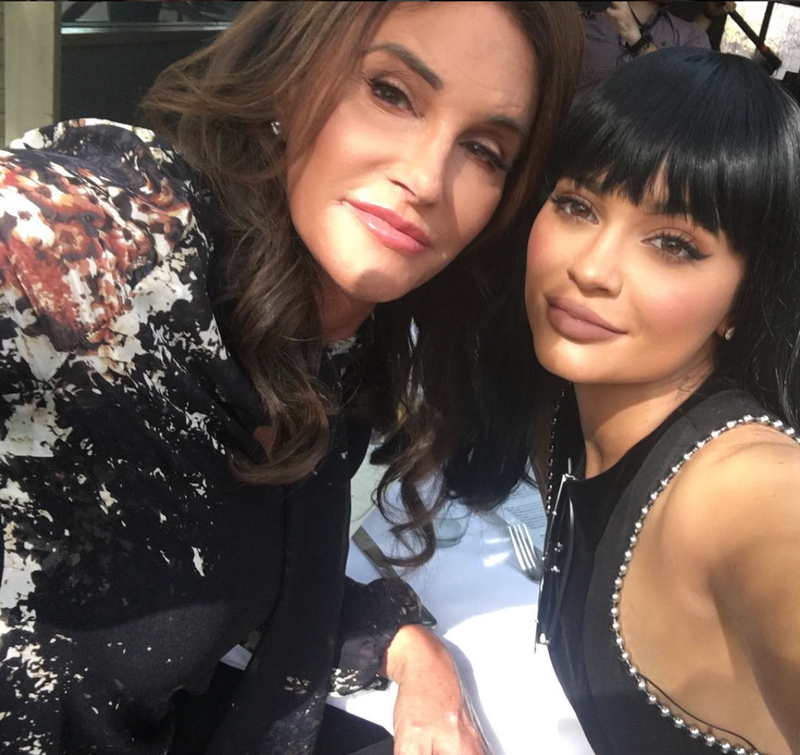 Obviously Caitlin Jenner has brought a tremendous amount of awareness to the transgender community. Because she’s a founding member of Kardashian culture, however, people tend to roll their eyes. I’m interested in your perspective given your vantage point. unhappiness, but it’s never too late to change paths. Anything else you want us to know about transgender children? One thing that is not widely understood is that gender identity has nothing to do with sexual orientation. Children do not have a sexual orientation until puberty, but they are able to understand their gender orientation from as young as a toddler. It is also important to understand that gender orientation is not black and white. It is more of a spectrum, and children can be somewhere in the middle. Transgender children may grow up to be gay or straight, so you can’t assume that being transgender is related to being gay. Finally, it is important to realize that these children are born this way. No one chooses this path in life, and it is a difficult one at times. Anxiety, depression, and suicide rates are higher in transgender people, and that’s why it is so important to provide these kids with resources, and ensure that they know it’s ok to be themselves, and it is perfectly normal to feel this way. When people validate their feelings, and really see them for who they are, you can see these children light up. Perhaps there is a parent reading this that thinks they have a transgender child or is dealing with issues like these at home. What would you say to that parent? I would encourage them to educate themselves. Even if you don’t think you have a transgender child, it would be important to educate yourself on the topic, because most likely your life will cross paths with someone that is transgender at some point. It is so important as parents to model love and acceptance of others. I would also say that it is important not to dismiss it as a phase, which is what many parents tend to do. Of course, what your child is going through could be a phase, and it is normal for children to explore different types of toys, clothing, TV shows, and role playing. However, if this has been going on for years, it could be damaging for a parent to brush it off. The child may feel as if they aren’t being heard and seen for who they are or that their feelings are not valid. Parents often try to guide their children towards the easy path in life, but for a transgender child that is like trying to guide them to be someone that they’re not, and it makes them feel awful inside, like their skin is crawling. Know that the younger the child is, the easier the transition is to go through, but you shouldn’t work this out on your own. Reach out to a professional in the area and explore some of the resources below. 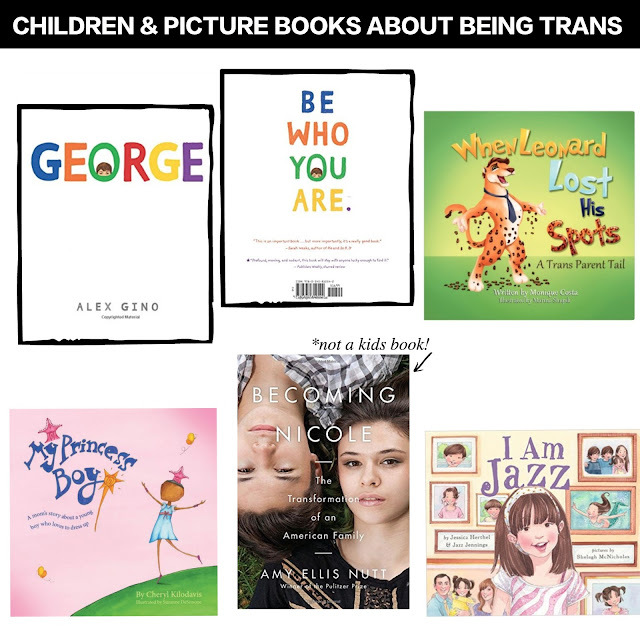 George by Alex Gino is a fictional book in children’s literature geared towards middle school students (but I loved it myself) in which the main character is a transgender student. Becoming Nicole by Amy Ellis Nutt is the true story of identical twin boys at birth, one of which transitions to a girl. Her parents also won the lawsuit that set the precedent that transgender children do not have to use a separate washroom in schools. I Am Jazz by Jessica Herthel is a picture book geared toward younger students that explains the true story of Jazz, a transgender child, in an easy to understand way. Jazz also has her own TV show, and has become a spokesperson and role-model for transkids. When Leonard Lost His Spots by Monique Costa and My Princess Boy by Cheryl Kilodavis are two other excellent pictures books on the topic. I'm so glad you wrote this and thanks to your friend for doing the interview! I had a similar transformative experience with an Oprah episode in 2003 followed by a gender non conforming youth I was counselor for at summer camp. Great interview! Jill provides information that clearly illustrates that if we all approached the differences among us with empathy and acceptance, and just plain common sense, maybe they wouldn't even have to become such "issues" .....we can learn a lot from little kids. Great interview Megan! Jill provides information that clearly illustrates that if we just approached the differences among us with empathy, acceptance, and just plain common sense, they wouldn't even have to even become such "issues"....we can learn a lot from little kids. I love this, Megan, and I love reading your deeper stuff. I like the shallow stuff too, of course. =) This is such an important issue because transgender people, adults and children, face so much resistance and discrimination. As Linda/your mom so eloquently said, a little empathy for and acceptance of our differences and what makes our world interesting goes a long way. Jill would be a dream teacher for any child, clearly. Thanks for sharing her experience and insight.